Federico Facchinetti, born in the 1992, is a music enthusiast, as well as passionate about travelling, arts and food. 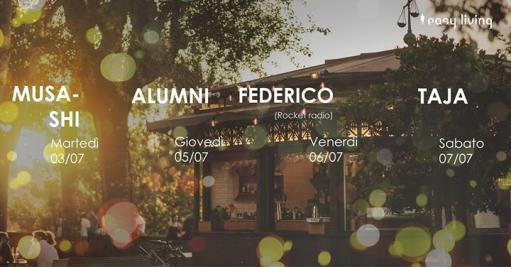 Dj and accurate digger, Federico conducts as host for Rocket Radio Milano a monthly appointment called “Eternal Love”, where guest artists from all over the world come up with their music selections, with no boundaries in terms of genres. Lately, he managed to bring his sound among the most relevant clubs in the Italian environment and not only like: Dude Club (Milan), Ex Forno Mambo (Bologna), Cipria (Padova), Jazz Re:Found (Torino), Brixton Jamm (London) and Room19 (Klaipeda – LT), Linke Soto (Netherlands) and many more. Thanks to his original disco soul and boogie imprint that characterizes his Dj sets, Federico was invited to the Italian format 180gr and NTS Radio London at Charlie Bones show. Elena Guarini aka TAJA è una ragazza completamente devota alla musica e alle arti grafiche che sta emergendo nella scena fiorentina per le sue capacità sui giradischi e per il gusto eccelso. Aperitivo dalle 19 alle 22.